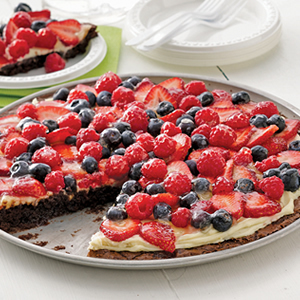 When you're loading up the family for a big barbecue celebration, be sure to load up a variety of freshly-made salads and deliciously decadent brownies. Whether pasta salads, potato salads or even those leafy greens, this side favorite is a perfect accompaniment to juicy grilled burgers, brats and steaks. 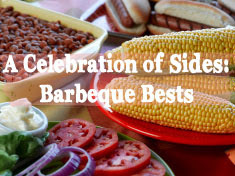 Because this savory barbecue fare can bring out anyone's sweet tooth, don't forget to dish out the desserts. Adding your favorite nuts, fruit and candy toppings to a rich, gooey brownie can melt the hearts of guests as easily as the hot summer sun. The best part about bringing a salad or brownie dessert - besides both being flavorful barbecue staples - most can be prepared the night before. This gives you more time to focus on the important things, like grilling your next culinary masterpiece and hanging out with your family. 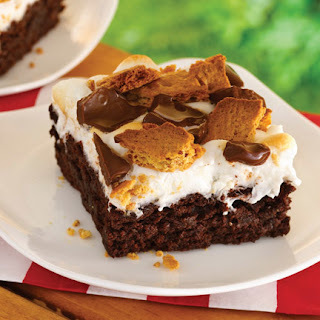 For more tips on what to bring to your next barbecue, visit www.bettycrocker.com/brownies and www.suddenlysalad.com. Preheat oven to 350°F (325°F for dark or nonstick pan). Grease bottom only of 12-inch pizza pan with cooking spray or shortening. Make brownie batter as directed. Spread in pan. Bake 26 to 30 minutes or until toothpick inserted 2 inches from side of pan comes out almost clean. Cool completely, about 1 hour. In small bowl, beat cream cheese, sugar and vanilla with electric mixer on medium speed until smooth. Carefully spread mixture evenly over brownie base. Arrange berries over cream cheese mixture. Stir jelly until smooth; brush over berries. Refrigerate about 1 hour or until chilled. Cut into wedges. Store covered in refrigerator. 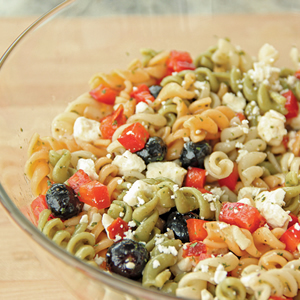 Feta, olives and tomatoes give a ready-in-30-minutes pasta salad its classic Greek inspiration. In large bowl, stir together seasoning mix, water and oil. Stir in pasta and remaining ingredients except cheese. Sprinkle with cheese. Serve immediately, or refrigerate. Prepare pasta according to package directions. 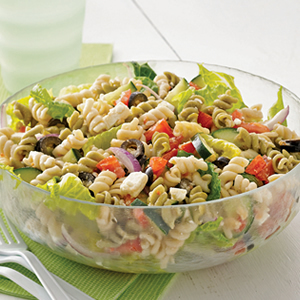 Stir in remaining ingredients, except feta, mixing well with pasta salad dressing. Sprinkle feta over salad. Refrigerate at least 30 minutes before serving. Preheat oven to 350°F (325°F for dark or nonstick pan). Make brownies as directed. After removing pan from oven, set oven to broil. Immediately sprinkle marshmallows and graham crackers over warm brownies. Broil about 4 to 5 inches from heat 30 to 60 seconds or until marshmallows are golden brown. (Watch carefully, marshmallows and graham crackers will brown quickly.) Sprinkle with chocolate candy. To serve warm, cool about 30 minutes. Cut into 4 rows by 4 rows.